During the hot summertime months, I use my quesadilla maker a lot more than what I typically do. It's a great way to whip up a quick & easy lunch or dinner, without heating up my house with the stove or oven. I don't know about all of you, but during the summer, I like to get in & out of my kitchen quickly. 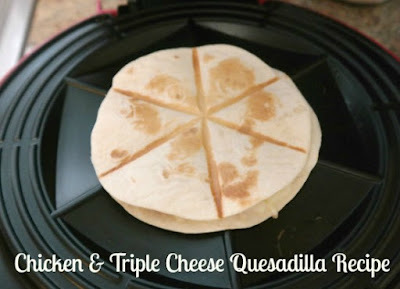 Preheat your quesadilla maker. Once it's heated up, lay down the first tortilla. Sprinkle a little bit of shredded cheddar cheese on top. Next toss on the cooked & diced chicken, then the shredded mozzarella cheese, then the diced red tomatoes and then the shredded American cheese with chopped onion. Place the second flour tortilla on top. Close the lid and cook for 1 1/2 to 2 1/2 minutes or until cheese has thoroughly melted and all of the filling ingredients are bubbly & hot. Remove and let sit for 2-3 minutes before cutting into wedges. Serve your sliced quesadilla wedges with sour cream, guacamole and/or your favorite salsa for dipping. Delicious! This is a simple recipe , but delicious. I like the combination of different cheeses, but I might add some fresh basil.